Compaq - 310619-001 HP/COMPAQ - SLIDING RAIL KIT FOR PROLIANT DL360 G3 (310619-001). REFURBISHED. IN STOCK. SHIP SAME DAY. Compaq - 252228-001 HP/COMPAQ - SLIDING RAIL KIT FOR PROLIANT DL360 G3 (252228-001). REFURBISHED. IN STOCK. SHIP SAME DAY. Compaq - 289570-001 HP/COMPAQ - RACK MOUNTING RAIL KIT (LEFT AND RIGHT) FOR PROLIANT DL380 G3 DL560 G3 (289570-001). REFURBISHED. IN STOCK. SHIP SAME DAY. Compaq - 365016-001 HP/COMPAQ - SERVER SIDE RAILS KIT FOR PROLIANT DL320 G3 G4 G5 DL360 G4 G5 (365016-001). REFURBISHED. IN STOCK. SHIP SAME DAY. IBM - 00N6994 IBM - RAIL KIT FOR ESERVER XSERIES 330 335 (00N6994). REFURBISHED. IN STOCK. SHIP SAME DAY. Hewlett Packard - 360332-003 HP/COMPAQ - 1U RACK MOUNTING RAIL HARDWARE KIT FOR PROLIANT DL360 G4 G5 DL140 G3 G2 DL320 G3 G4 G5 (360332-003). REFURBISHED. IN STOCK. SHIP SAME DAY. Compaq - 232793-001 HP/COMPAQ - RACK MOUNT RAIL KIT FOR PROLIANT DL380 G2 (232793-001). REFURBISHED. IN STOCK. SHIP SAME DAY. Hewlett Packard - 360104-001 HP/COMPAQ - 1U RACK MOUNTING RAIL HARDWARE KIT FOR PROLIANT DL360 G4 G5 DL140 G3 G2 DL320 G3 G4 G5 (360104-001). REFURBISHED. IN STOCK. SHIP SAME DAY. Hewlett Packard - 360332-001 HP/COMPAQ - 1U RACK MOUNTING RAIL HARDWARE KIT FOR PROLIANT DL360 G4 G5 DL140 G3 G2 DL320 G3 G4 G5 (360332-001). REFURBISHED. IN STOCK. SHIP SAME DAY. Compaq - 360322-001 HP/COMPAQ - 2U RACK MOUNT RAIL KIT (COMPLETE KIT) FOR PROLIANT DL380 G4 DL380 G5 DL385 G1 DL385 G2 (360322-001). REFURBISHED. IN STOCK. SHIP SAME DAY. Compaq - 360332-002 HP/COMPAQ - 1U RACK MOUNTING RAIL HARDWARE KIT FOR PROLIANT DL360 G4 G5 DL140 G3 G2 DL320 G3 G4 G5 (360332-002). REFURBISHED. IN STOCK. SHIP SAME DAY. Hewlett Packard - 365002-002 HP/COMPAQ - 1U RACK MOUNTING RAIL HARDWARE KIT FOR PROLIANT DL360 G4 G5 DL140 G3 G2 DL320 G3 G4 G5 (365002-002). REFURBISHED. IN STOCK. SHIP SAME DAY. Compaq - 360322-002 HP/COMPAQ - 2U RACK MOUNT RAIL KIT FOR PROLIANT DL380 G4 DL380 G5 DL385 G1 DL385 G2 (360322-002). REFURBISHED. IN STOCK. SHIP SAME DAY. Dell - 3C452 DELL - RAPID RAIL KIT FOR POWEREDGE (3C452). REFURBISHED. IN STOCK. SHIP SAME DAY. Hewlett Packard - 720863-B21 720863-B21 HP - 2U Ball Bearing Rail Kit For Proliant Dl380 G8 SFF. New Retail Factory Sealed With Manufacturer Warranty. Compaq - 360322-003 HP/COMPAQ - 2U RACK MOUNT RAIL KIT (COMPLETE KIT) FOR PROLIANT DL380 G4 DL380 G5 DL385 G1 DL385 G2 (360322-003). REFURBISHED. IN STOCK. SHIP SAME DAY. Compaq - 360322-503 HP/COMPAQ - 2U RACK MOUNT RAIL KIT (COMPLETE KIT) FOR PROLIANT DL380 G4 DL380 G5 DL385 G1 DL385 G2 (360322-503). REFURBISHED. IN STOCK. SHIP SAME DAY. Hewlett Packard - 737412-001 737412-001 HP - 2u Ball Bearing Rail Kit For Proliant Dl380 G8 SFF. New Retail Factory Sealed With Manufacturer Warranty. Dell - F1052 DELL - 1U VERSA RAIL RACK KIT FOR NAS POWERVAULT (F1052). IN STOCK. SHIP SAME DAY. Hewlett Packard - 718214-002 718214-002 HP - Rail Kit 2u Easy Install LFF Friction For Proliant Dl380 G9. New Bulk Pack. Dell - 8X379 DELL - 1U VERSA RAIL KIT FOR POWEREDGE PE1650 PE1750 (8X379).NEW. IN STOCK. SHIP SAME DAY. Compaq - 252983-001 HP/COMPAQ - RACK RAIL KIT FOR PROLIANT DL360 G2 G3 (252983-001). REFURBISHED . IN STOCK. SHIP SAME DAY. Compaq - 216970-002 COMPAQ RACK MOUNTING RAIL KIT PN: 216970-002. FOR DL320 G2. Dell - 310-8194 DELL - 2U 4 POST RAPID VERSA RAIL KIT FOR POWEREDGE 2950 2970 (310-8194). NEW. IN STOCK. SHIP SAME DAY. Compaq - 303341-B21 HP/COMPAQ - SLIDING RAIL KIT FOR PROLIANT DL360 G3 (303341-B21). REFURBISHED. IN STOCK. SHIP SAME DAY. Dell - FN360 DELL - 2U 4 POST RAPID VERSA RAIL KIT FOR POWEREDGE 2950 2970 (FN360). NEW. IN STOCK. SHIP SAME DAY. Dell - GJ182 DELL - 2U VERSA RAIL KIT FOR POWEREDGE 2850 (GJ182). REFURBISHED. IN STOCK. SHIP SAME DAY. Compaq - COMPAQ SERVER RAIL KIT P/N: 400838-001 RAIL KIT FOR ML350 ML570 DL580 6400R. SAME AS 134699-001. Compaq - COMPAQ RAIL KIT P/N: 216970-001. FOR 1U RACK. Compaq - COMPAQ PROLIANT 8500R RACK RAIL KIT P/N: 105989-001 . Compaq - COMPAQ PRODUCT: COMPAQ RAIL KIT FOR PROLIANT P/N: 163737-013. 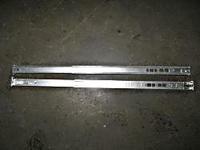 Compaq - 228894-B21 COMPAQ 4-POST SLIDING RAIL KIT PN: 228894-B21. Rackmount option kit for ProLiant DL380 G2. Dell - 8U159 DELL - RAIL KIT FOR SILKWORM 3850 SERVER (8U159). IN STOCK. SHIP SAME DAY. Compaq - 355846-002 HP/COMPAQ - MOUNTING RAIL KIT FOR PROLIANT (355846-002). IN STOCK. SHIP SAME DAY. Compaq - 232451-001 COMPAQ RACK MOUNTING RAIL KIT PN: 232451-001. FOR PROLIANT DL360 DL320 DL320 G2 ML330 G2 ML310 TASKSMART C-SERIES C4000 MODEL 30/40/50 W2200 STORAGEWORKS 3U RM STORAGE TAPE ENCLOSURE. Compaq - 360322-002 QUICK RELEASE RAIL KIT PN: 360322-002. Compaq - 300605-001 COMPAQ RACK MOUNTING RAIL KIT PN: 300605-001. FOR DL380 G3 AND DL560 G3. Compaq - 292230-001 HP/COMPAQ - RAIL KIT FOR PROLIANT ML350 G3 (292230-001). NEW . IN STOCK. SHIP SAME DAY. Hewlett Packard - 378284-B21 378284-B21 HP BL P Class 1U Power Enclosure with 6 Power Supplies & Rail Kit. New Bulk Pack. Compass Outdoor Product - 356545-B21 HP/COMPAQ - TOWER TO RACK CONVERSION RAIL KIT FOR PROLIANT ML370 G4 (356545-B21). NEW RETAIL. IN STOCK. SHIP SAME DAY. Hewlett Packard - 380314-B21 380314-B21 HP BL-p Class 1U Power Enclosure with 2 Power Supplies & Rail Kit. New Bulk Pack.